Our On Demand / Purge Service operates in much the same way, the only difference is quantity. If you have a shredding requirement but the frequency is irregular you can avail of our On Demand service. 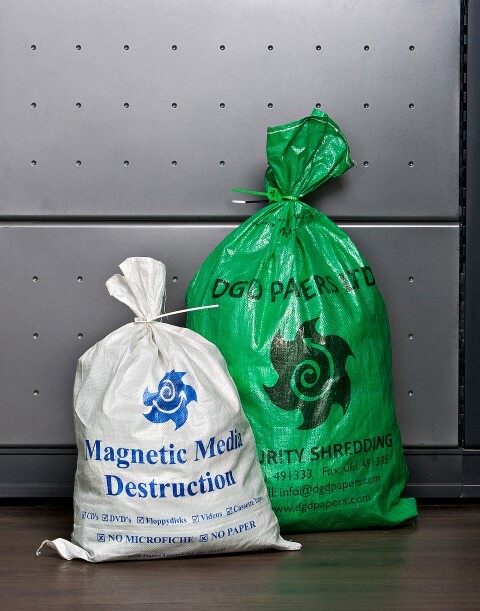 We supply you with our Green Shredding Bags; you fill them and contact us to arrange a collection. There is no charge for spare bags and we are happy for you to keep a supply of them for your use. Once you arrange a collection we will arrive at your premises on an agreed date. For Off-Site Services we will retrieve the material and transport it to a Van or Truck to be brought back to our destruction facility for processing. For On-Site Services we will retrieve the material and bring it to a Mobile Shredding Unit to shred the material there and then. When finished a detailed service docket is written which is then signed by both the driver and your authorised representative. A destruction certificate is issued later with your invoice. We can also supply the labour to remove the material from storage for you if required.